while Garmin 410 showed 5.06k exactly as before. In fact the turning back point at 2.5k was in fact a bit earlier than my last run. Garmin also showed a slight difference in elevation gain of 12m between 2 runs. I guess an error of 3.95% isn’t too bad (assuming Garmin is right). 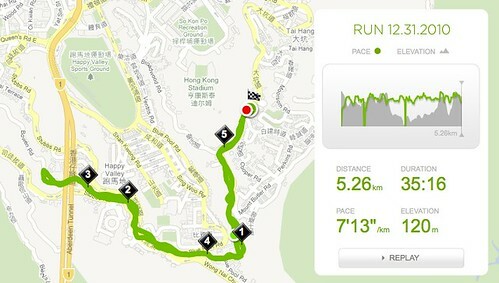 I’ll do a longer run this Sunday with Garmin and Nike+ GPS app. This entry was posted on	December 31, 2010 at 8:40 pm	and is filed under Uncategorized.